Free twitter tools whatever you need. We've made amazing tools and working more for new tools. We support your stats with awesome graphs to see up and down easily. Sign in with Twitter your twitter account and give permission to Unfollower Stats. 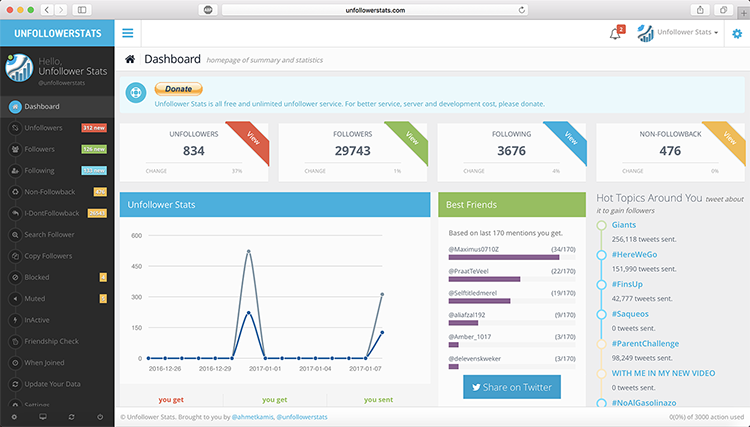 After your Sign-In App will start to collect unfollowers information for your account. 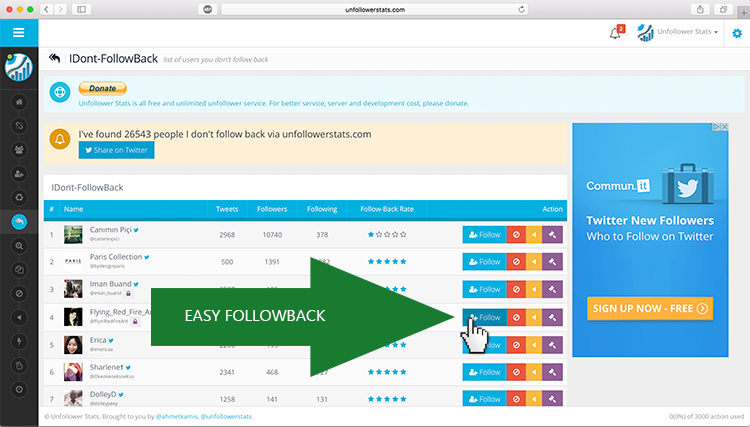 Visit everyday and see who unfollowed you on twitter or use other tools. 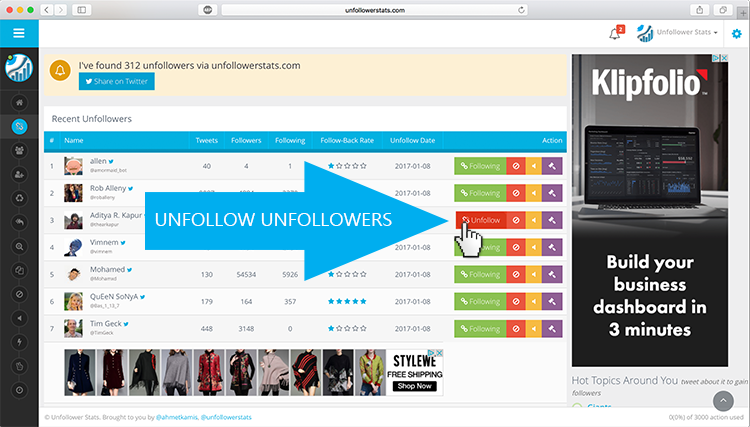 Easily, After you Sign-in you can visit every day to see your unfollowers, you can unfollow or block them. Or active your daily stats for your twitter account and see you unfollowers on your timeline. As we said before, we are storing your followers and when you want to see we find out who unfollowed you. 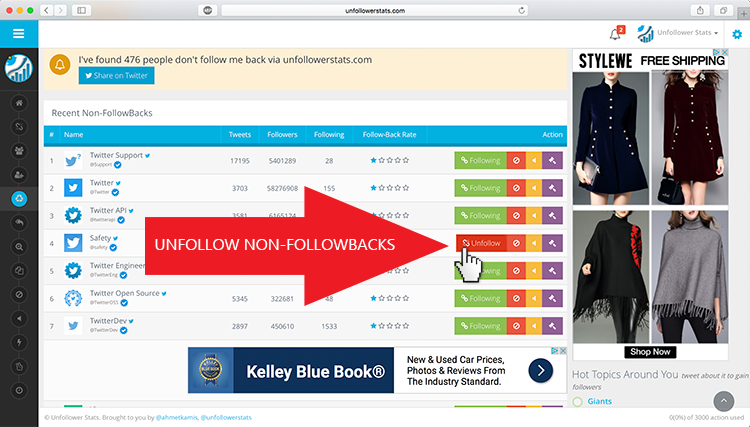 Easier way to unfollow your unfollowers! Are you followback'er ? That tool is perfect for you! Non-Followbacks are people that you follow them and they dont follow you. App collect everyday your Non-Followbacks and shows you. That tools is great for #followback twitter users. If you want to follow people that who followed you. That app ise tracking who followed you and you didn't follow them back. Start to follow your Fans! 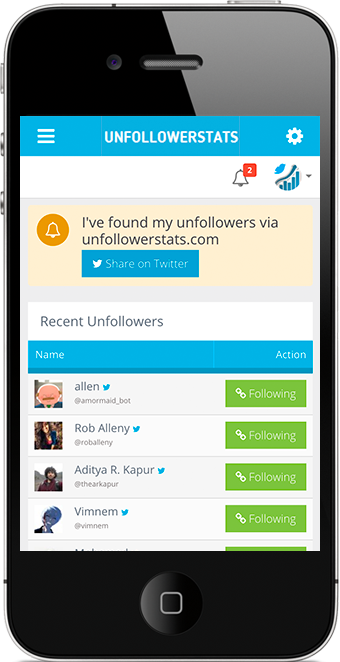 UnfollowerStats is daily tracking and storing your account's follow, following, unfollowing stats to our servers. This website also work awesome for your mobile devices too. designed and developed by UnfollowerStats, thanks to Twitter © 2014. All Rights Reserved.